Home • Edenred France launches its Ticket Kadéos® iPhone application! 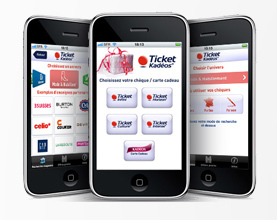 Edenred France launches its Ticket Kadéos® iPhone application! This fun application lists the partner brands accepting Ticket Kadéos® gift vouchers and cards, including 360 French brands, 50 of them exclusive, and 30,000 independent stores. It also identifies those in the vicinity through geolocation. Gift-voucher-holders enjoy even more benefits through the exclusive Beneficio Club® deals.